Each six day class will take you, step-by-step, through the process of hand crafting a Brian Boggs designed chair. They cover every aspect of making a ladderback chair, beginning with lumber selection all the way through final assembly using hide glue. The introductory classes are open to woodworkers of any skill level. In a step-by-step manner, they will introduce you to all the processes and techniques needed to make a ladderback chair and are also designed to teach you the underlying principles of chair geometry and construction. The advanced classes build on the skills and ideas taught in the introductory classes by working, step-by-step, on ladderback chairs with more complex construction. They also introduce methods of working used in production chair shops. These classes are open to woodworkers who have taken one of the introductory classes with me or David Douyard or have taken any class with Brian Boggs in the past. Hear what students have to say about their chair class experience. Follow two students through a six-day class. Each class takes you step-by-step through the process of hand crafting a Brian Boggs designed chair. They cover every aspect of making a ladderback chair, beginning with lumber selection all the way through final assembly using hide glue. Because class size is limited to three students, you get personalized instruction and can work at your own pace. Every process is broken down into small, manageable steps so that you can concentrate on mastering one task at a time before moving onto the next. Whenever a new process is introduced, especially when hand shaping parts, you are given the opportunity to practice on spare material before working on your actual chair part. In addition to showing you how, I always explain why, so that you will understand underlying concepts and how each step fits into the big picture. Each class includes an 80+ page, fully illustrated manual, that documents the process for building your chair from beginning to end. It serves as a step-by-step reminder of the steps taught in class. Because the manual is so complete it minimizes or eliminates the need for you to take notes. This allows you to spend all your class time learning new techniques and working on your chair. The manual also has detailed drawings of every jig and form used in the chair. This will give you a huge head start when you begin to make that next chair in your own shop. 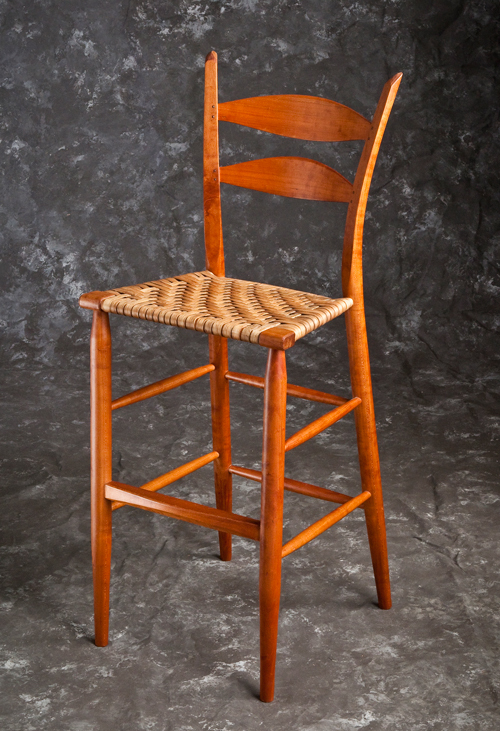 I am also available, via e-mail, to answer questions as you work on your next chair at home. About a mile from my shop. All classes take place in my shop about 5 miles from Strasburg, Virginia, a small town located in the Shenandoah Valley about 75 miles west of Washington, DC. It is close to the intersection of I-81 and I-66 so it is easy to get to.